I first met Liara Okiddo as a result of visiting her home on the Region of Golden Rose back in July 2013, Garden of Eden was a 8192 square metre parcel of land where she had built a compact tour de force of what can be achieved without necessarily needing an entire region of your own in which to create an eye-catching build. It was a truly amazing and verdant design, rich in colour, flora and fauna, creating a tropical island like feel in which she had located her in-world studio and gallery. 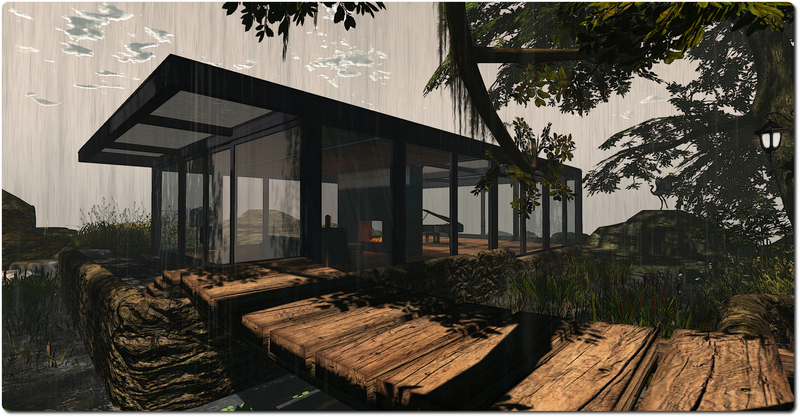 In November 2013, Liara extended an invitation for me to see her next project – then a work in progress, Isla Okiddo, her own homestead, which opened to the public in February 2014, forming another visually stunning build where she had again created a wonderful tropical paradise in which she located her gallery and her home. 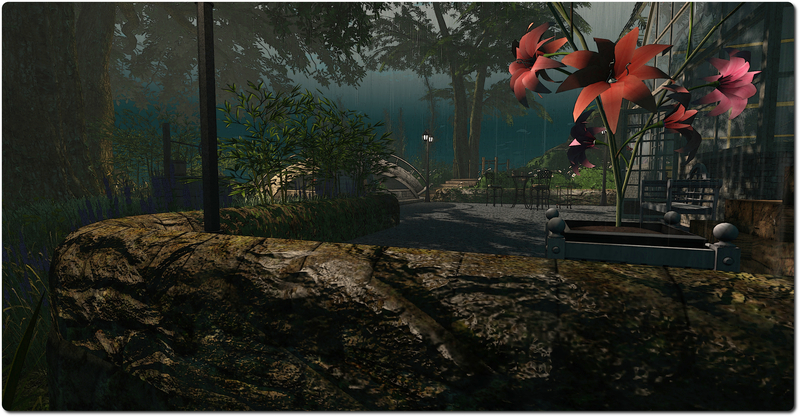 Sadly, Garden of Eden and Isla Okiddo now only exist in memory and pictures, although they remain two of my top 10 all-time most beautiful locations in Second Life. More recently, Liara has been working on a new project, which she pinged me about early on (and for which I still owe her an apology, and life, the universe and everything meant I never really supplied the feedback she’d requested). The project opened earlier in July (and which the physical world again conspired to keep me away from) and is another masterpiece. Le Botanique is a 64 metre square slice of rain forest-like beauty floating in the air above Miriam Brown, and it is a marvel of design and the use of materials – around 75% of the build is materials enabled. 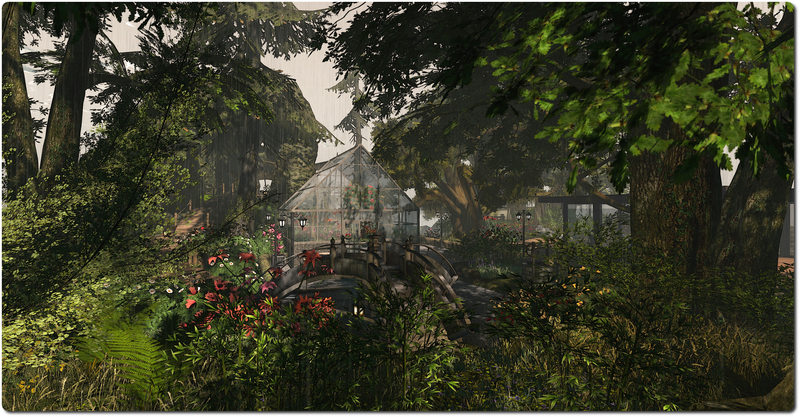 You arrive inside a summer-house in one corner of the forest (do make sure you accept the local windlight, if offered, on your arrival). The staccato beat of rain falling on the glass panels of the roof is your greeting, together with the crackling pop of wood burning in the hearth its accompaniment. A piano from the other room in the house might also add a little harmony to your arrival. But all these serve as background to the lush, rain-soaked slice of tropical splendour which awaits you beyond the sliding doors. Rain splashes over everything here, pattering across cobbled terrace and wooden walkways alike, leaving a wet sheen over mossy walls, grassy rocks and dripping from the lush vegetation. A wooden bridge passes over a narrow channel of water separating the summer-house from an old terrace where sits a wrought iron garden table and chairs, dripping in the shower alongside a tall green house in which grow where exotic lilies and other plants are growing in rich abundance, sheltered from the rain. Follow a set of wooden steps from here, and they take you up to the high point of the build, a rocky grotto where sits a table an chairs under a canvas awning. 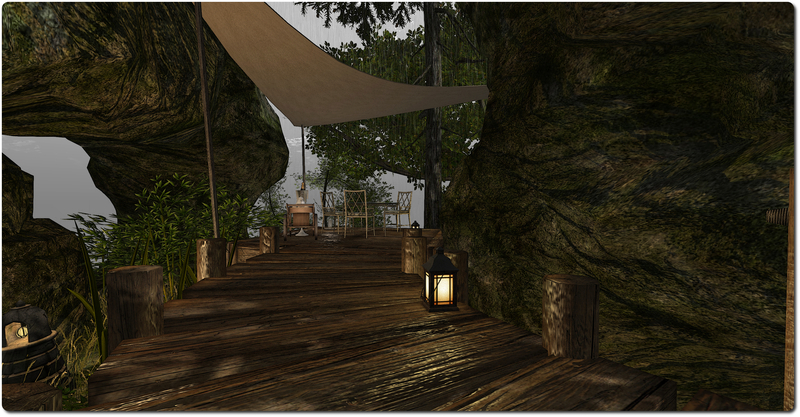 Elsewhere, stepping-stones guild the visitor across the expanse of rain-speckled water below the summer-house and up to another rocky ledge offering another little seating area under canvas, this one with a touch of romance added: candles on the table, complete with a bottle of wine, two glasses, and a red rose. All of this exists an in rich spread of flowers and plants, tall trees through which sunlight slants, and over which the rain falls steadily. It’s an amazing sight for even the most causal visitor. 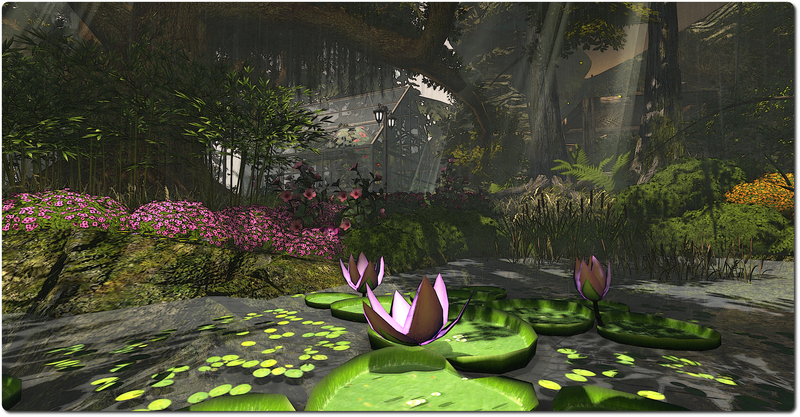 However, if you want to experience Le Botanique to the fullest, then you should enable your viewer’s Advanced Lighting Model (Preferences > Graphics > check Advanced Lighting Model) option, if it is not already active. This shouldn’t result in too big a performance hit on your system – you don’t have to enable Shadows as well (which are the performance killer). When you do so, Le Botanique will spring into even greater life as the wet sheen on the rocks and walls becomes visible, and the light from lamps and lanterns is reflected in the wet surfaces around you. I’ve fiddled around with materials myself in SL and more noticeably on Kitely with Fallingwater, but I’ve done nothing to the depth of Liara’s project. As noted above, the built features the use of materials across about 75% of it, and this has involved Liara carefully selecting copy / mod items which she has then painstakingly retextured with custom diffuse (texture), normal (bumpiness) and specular (shininess) maps, and the results are truly stunning, and incredibly life-like; so much so in fact, that it’s possible to miss some of them without a degree of careful camming, therefore time is the order of the day when visiting. 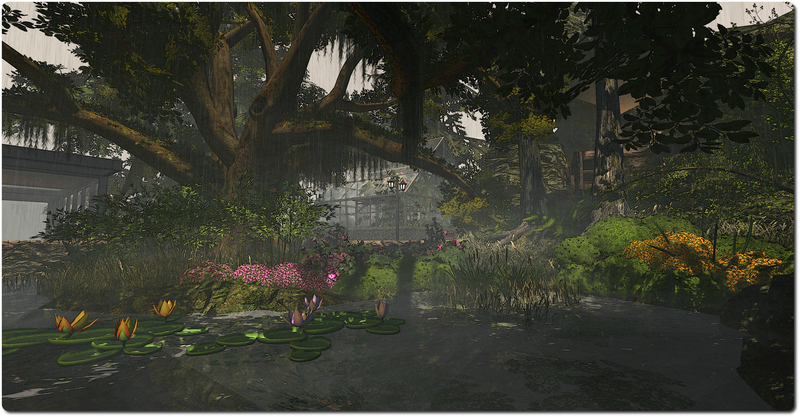 For those interested in the technical aspects of the build, Liara has created a special Flickr album charting her work on Le Botanique, and to be honest, her photos far outweight my meagre efforts here should you need any visual persuading to make a visit. I never cease to be amazed and awed by Liara’s work; each of her creations builds on the foundations laid by the last, and each is in turn an incredible and beautifully immersive environment. In this, Le Botanique is no exception. It is simply glorious; a stunning demonstration as to what can be achieved with time, patience and materials, and (again) without needing an entire region in order to do so.